WINNIPEG, MANITOBA – After 11 years, Protegra has rebranded its Correlate case management software line of business to Better Outcomes to more accurately reflect the value the software provides to social service organizations and their team members in removing barriers and achieving their missions with technology. 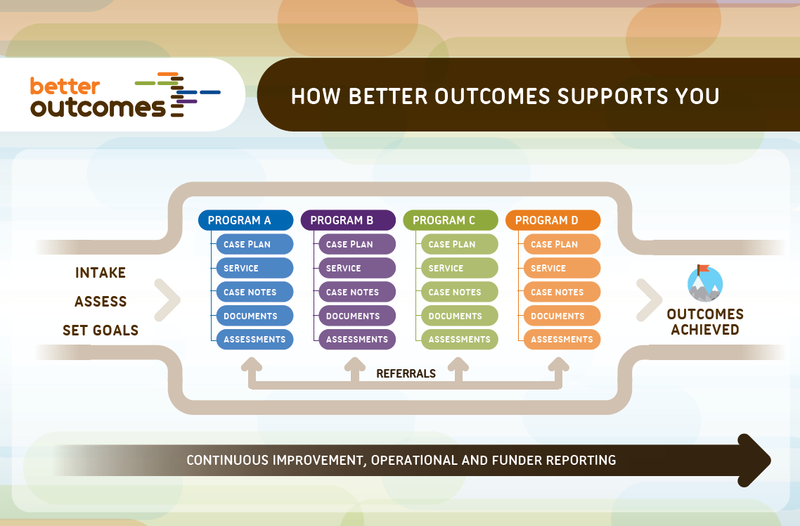 Better Outcomes is a subscription, cloud-based case management software platform designed for social service organizations to help manage information on the people they serve, from intake and assessment through to service delivery and outcomes reporting. Client information that is unique to the organization can easily be configured and can be changed as new information requirements emerge. "The re-branding allows us to more clearly communicate the value of Better Outcomes beyond our case management software platform to also include better outcomes focussed consultation and software implementation services," says Wadood Ibrahim, Protegra co-founder and steward. "This new brand and expanded services is great news for many social service organizations that may perceive implementing a cloud-based case management system to be too difficult and fear the change that technology will introduce. Our Better Outcomes team will first seek to understand the organization's challenges and adapt the consultation, implementation services and ongoing training as required and as the organization's needs change." "The key differentiator with Better Outcomes is that we fit you, " says Better Outcomes team member, Barb Spurway. "Social service organizations do not need to 'conform' to our technology to achieve improved service deliver outcomes. With our consulting assistance, social services organizations can easily input, access, share, retrieve, analyze, and report client information - wherever they deliver services. Better data leads to better decision-making, and ultimately allows social service organizations to spend more time providing service to their clients and fulfilling their missions." The Better Outcomes platform does not require special hardware or software as all the data is stored in the cloud and can be accessed from anywhere at any time. The platform can also support large numbers of users and high data volumes. "My capability as a manager has greatly improved thanks to the power of Better Outcomes," says Al Benarroch, Executive Director of Jewish Child and Family Service. "We are spending less time on paper work and data entry, freeing up our staff for other work. We can locate information we need more easily and the staff is inputting better quality information to Better Outcomes. I no longer travel with paper. I take only my laptop and iPad, and on a recent trip I didn't even take the laptop out of my suitcase. I accessed everything I needed off my iPad. If I had to describe Better Outcomes in three words, they would be: efficiency, accountability, and user-friendly." "Our clients have access to excellent help desk and training support, and never have to worry about technology upgrades, backups, costs associated with hardware or hosting," says Ibrahim. "We firmly believe that we all have potential, without exception. Better Outcomes exists to help the social services sector focus on their missions and the work they love to do every day." Better Outcomes is a member of the Protegra community of software-driven businesses that help organizations and individuals solve problems with innovative solutions. Our goal is to make a difference in the lives of our clients, Protegrans, and the larger community. Founded in 1998 in Winnipeg (Canada), Protegra has built an excellent reputation for delivering software-enabled solutions to the public and private sector throughout Canada, the United States, Europe, and Japan. Protegra has consistently ranked in the top 20 best places to work in Canada (six years running) by the Queen's School of Business and Great Places to Work Institute.